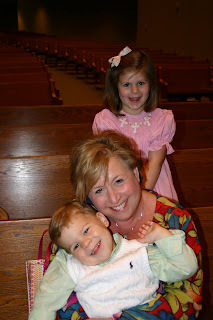 olivia, nana, and jack. 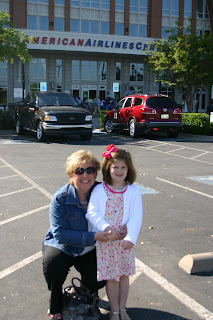 we LOVE that we get to see nana at church on sunday mornings now. uncle christman and jack. pop is back there too! after the egg hunt picture. you can't tell but they had full baskets. sweet cousins dressed up in their easter best. the fun wasn't over yet! we loaded up and drove out to allen to celebrate that evening with the blanchettes. we had more yummy food. 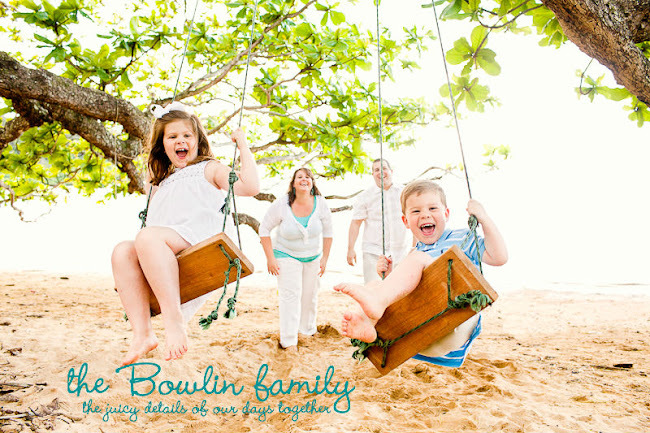 more family! 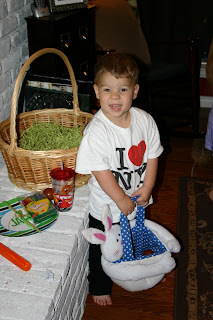 more easter basket surprises! 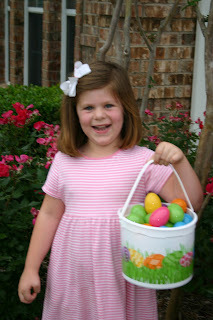 and one more egg hunt! 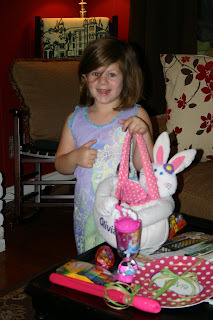 olivia with her third basket full of easter eggs for the day. she was LOVING it!! 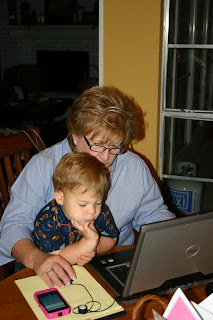 jack and nana counting and checking out all his eggs. what a wonderful day filled with so many reasons to be thankful. most of all i am humbled and grateful to know Jesus Christ personally. i am so grateful He desired to have a relationship with me so He lived a perfect and sinless life on earth, died on a cross, was buried, and rose again so that i might have life abundantly and eternally with Him. HE is what today is really all about and the reason we celebrate. to HIM be the glory and honor for all that He has done and for all the blessings He pours out to us. hope you and your family had a special day celebrating today. happy easter!! she doesn't have a name yet, but i love her all the same. 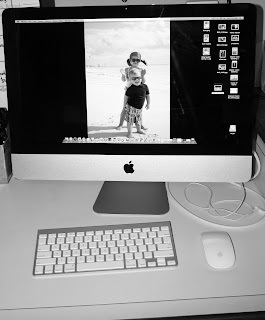 my last computer was "honey." she was named after my favorite type of apples- honeycrisp. i'll let you know when i have given her a proper name, but until then you (mom and uncle mark- the only two people who are still actually reading this) can read all the new blog post i have been writing to try and catch up. oh, and if you have any name suggestions, i'd love to hear them. poor little jack had to have surgery again!! 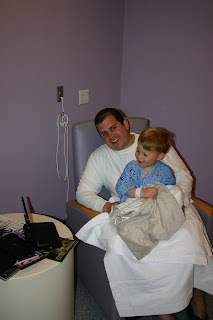 in october 2009 jack had ear tubes put in and his adenoids taken out. that was a successful surgery, but since then the tubes in his ears fell out the fluid in his ears has returned. :( his ent has been monitoring the situation for a while and feels that it would be best for jack to have a second set of tubes put in his ears. this will allow him to get off of the medication he takes on a daily basis as well as allow him to hear more clearly (the fluid was minimally affecting his hearing). during our last visit to the ent, right before scheduling the surgery, she mentioned that she thought his adenoids had enlarged again as well. so those have to come out too! that all happened about a week ago, and today was the day for surgery. 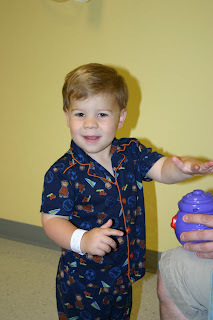 we woke jack up early this morning, put him in some cute jammies and headed for the surgery center. he had no clue what was about to happen and was loving the waiting room filled with toys, places to climb, and movies to watch. dr. coffey, his ent came in and carried him back to the operating room. about 30 minutes later she came back and told us everything went perfect and that jack did a great job. relief! a few minutes later we were able to go recovery to see him and hold him. relief again! jack did so great coming out of the anesthetic this time, so it was not long before they were pulling out the iv and we were loading up to come home. nana was waiting for us (she took olivia to school for us). jack was happy to see her and i was happy she was willing to stay for the day and help me catch up on laundry and organize a few things around the house. we are thankful that jack did so well in surgery and hopeful that this will make him stay healthy for a long time! we go back soon for a follow up visit and expect a good report!! once again, we were in and out of the surgery center in a few hours AND and jack has new tubes IN and the adenoids are OUT!! 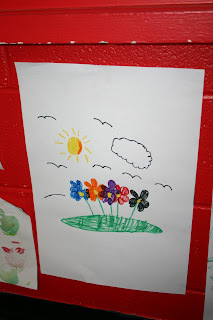 last week at school her class has been learning about all different famous artist while they have been studying the letter A. while learning about these artist they have been creating their own masterpieces. 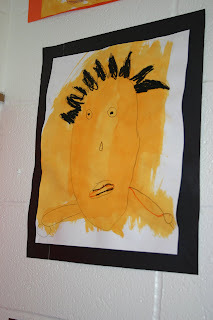 the parents were invited to an "art walk" at the end of the school day to see all of the art on display. it was so neat to see olivia's art. she was so proud to show off her work. not sure which one is hers, but she said this one was really fun to make. this is a monster! made with watercolors and crayons. olivia's most favorite medium to create art- markers and plain white paper. the girl LOVES to draw. these were some of the pieces she was most proud of. 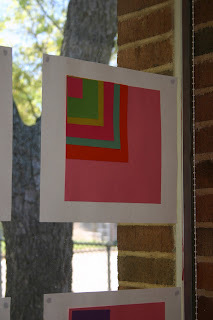 i loved comparing olivia's piece to the other students in her class. it fits her personality perfectly. her art is very organized and the only one like it on the whole wall. was so much fun!! both of the kids love toy story (it is the best gender neutral movie ever) and so i was pretty sure they would love this live show on ice. 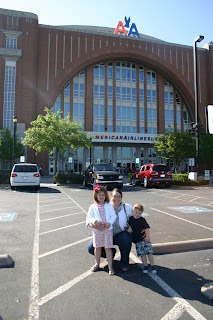 pulling in the parking lot at the american airlines center always means that fun is waiting inside. 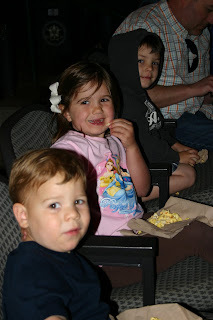 the kids are fortunate to have seen the circus, a past disney on ice show, and some basketball games there. nana decided that she wanted to go and see the look on jack's face as he saw woody, jessy, bullseye, and the rest of the crew skate right in front of him. his reaction did not disappoint. he was pointing and yelling in excitement for most of the show. jack's favorite part was the "evil zerg shooting at rex and buzz saving rex." olivia thought ken and barbie's skating was the best! they did some impressive tricks. i always laugh at spanish buzz and ken's fashion show.